UPDATE: I’m not working with these kind of tablets anymore (with 32bits EFI BIOS). If you want a good distro for these “Atom” tablets I recommend you LINUXIUM ISO’s with kernel 4.12. Other features like gestures (touchegg), on-screen keyboard, etc. are already/still included on the standard XJUbuntu ISO’s. You can also install newer kernels with ukuu tool included in ubuntumatics. XJUbuntu TAB or XJUbunTAB or XJUbuntu is a special distro for Intel tablets (x86 and amd64 , not ARM), hybrids 2 in 1, netbooks, etc. based on Xubuntu 16.04. Specially Intel Atom Baytrail or Cherrytrail processors with Realtek 8723BS WiFi cards and 32 bits EFIs. When installed, it lets you choose to login on 2 different Desktop Environments: Unity or XFCE (default). Unity might be considered better for tablet/touch mode, mainly for his multitouch gestures but XFCE performs better for desktop usage with mouse/keyboard and thanks to touchegg it’s very convenient in touchscreens too. XFCE is more customizable and faster, specially on low powered devices like tablets/netbooks. But you will also benefit on high-powered devices from the speed and customizations. Firefox and Chrome can scroll with one finger natural scroll too (like Android/IOS) thanks to extensions installed. I am testing this on a Teclast X98 Plus A5C8 but I hope this can be useful for other kind of tablets and computers in general as well. Please leave feedback in the comments with your hardware and release tested. Or connect and USB keyboard and press F7 to select booting partition. Kernel and system optimized for Baytrail/CherryTrail Intel CPUs. 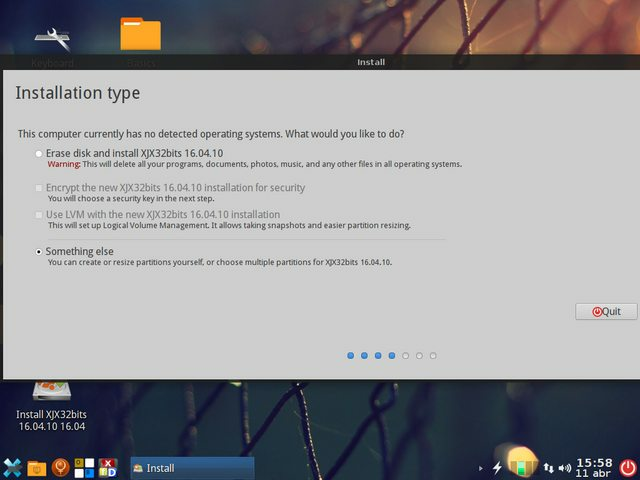 You can follow this guide to install this kernel in any other Ubuntu based distro. Quick-synergy integrated in XJubuntu lets you use the same keyboard/mouse to control your PCs, tablets and phones. Or use unifiedremote to remote control your tablet from your phone. Working on auto-adjust but first it needs to access internal cameras. This works best in Unity, in XFCE has worked but not anymore. Now you can use 2-fingers tap with TouchEgg . Access to eMMC internal flash and microSD slot card. You can rotate the screen but the touchscreen doesn’t rotate accordingly in XFCE, it needs manual adjustements (Solved)… In Unity it works Ok. I have created in XFCE some scripts/buttons for direct access. Possible solutions: this script and this. But first it needs this driver active and “iio-sensor-proxy” installed in kernel. No problems with other card sizes up to 64GB? it worked in kernel 4.4.x? but not in 4.5.. Audio sent over WiFi to Android smartphone with Soundwire works , or to a PC running Android in a virtual machine. SOLUTION: If you want to build your own Linux kernel with HDMI audio support apply this patch to Linux 4.5, and enable CONFIG_SUPPORT_HDMI=y in the kernel config. First backup the internal eMMC with Clonezilla. 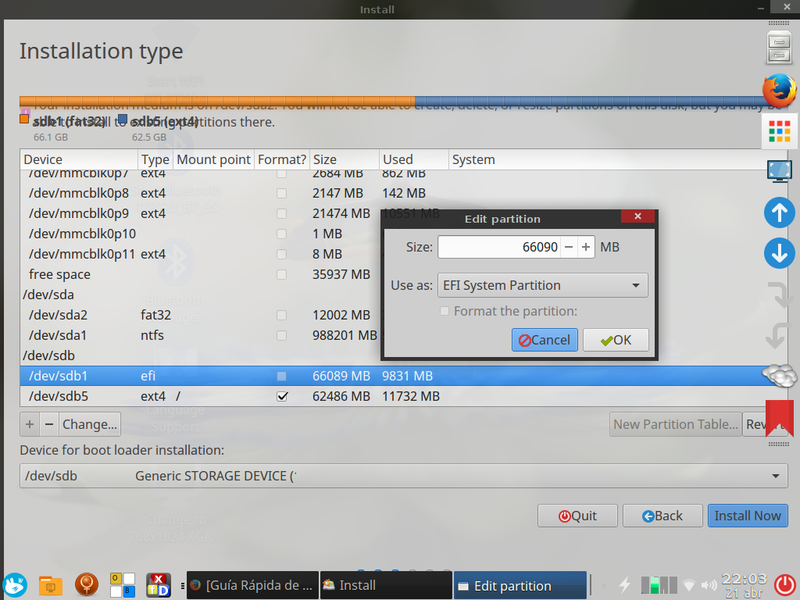 Note that some kernels only can see 7 partitions max, so not every Clonezilla will work right. I’ve uploaded one that works right here. You can now install the distro on internal eMMC and/or external USB drives (I haven’t tried microSD), but still needs some manual grub boot and later “sudo update-grub”. There are Grub menus already created for different scenarios that can be modified to your needs. Here you can see some screenshots of my installation from one usb disk (/dev/sda) with the live-installer into another usb disk (/dev/sdb) where I have permanently installed the distro. Don’t use swap partitions unless you really need it because it can degrade flash drives. Then run “Grub-customizer” for more options and select your manual entry to be the default selection. I also managed to TRIPLE-BOOT from internal MMC, these are the partitions after resizing Android cache, system and data, leaving almost 14GB available for XJUbunTAB. *** After install you may still need to select your language/keyboard and reboot. XJubuntu distro has UEFI enabled 32 / 64 bits and you can remaster your own customized copy thanks to PinguyBuilder. There is a script in ~/a to automate creation of the live/skel user and run PinguyBuilder to create your own personalized distro. There is another script in ~/Patches/patch to make the kernel work with WiFi/Bluetooth from Realtek 8723BS and other patches that might be needed depending on your kernel/tablet. XJubuntu is an optimized remix of Ubuntu+Xubuntu with some useful and common programs pre-installed. Thanks for your feedback! Thanks for your comments, reviews, fixes and anything you can contribute to make these tablets work with Linux. WiFi working with kernel 4.5.1 patched by Akmelius. Resolution is set to 768×1024 for a better view. Press F7 after boot to select boot device. In the picture you can see XJubuntu installed in the USB microSD card reader (last menu item). The hub connects also a GigaEthernet network and a remote mini-keyboard/touchpad. If you got rid of Windows and want to update BIOS on X98Plus/Pro you can do it directly from a pendrive following this guide. Projects like Shashlik or ARC Welder to run native Android apps directly on Ubuntu.